The debate between Bill O'Reilly and Jon Stewart will be streamed live on the Roku tomorrow night (Saturday, October 6th, 8PM EST). Add the channel to your Roku (in the Channel Store), then sign-up at therumble2012.com/roku. The cost is $4.95 (credit card or Paypal). I tried to watch this online live with a laptop plugged into my TV, and their server crashed from the demand; I wasn't able to log in. Checking twitter, they likely lost a lot of viewers who would've paid to see it live, but may not do so for the on-demand stream or download. They are offering refunds to those that paid in advance and couldn't see it live and choose not to view it later. The debate is still up for purchase and can be viewed on Roku, iOS devices, Android devices, or the web browser on a Boxee Box, Google TV, Logitech Revu, and PCs. You can either stream it or download it. I downloaded the high-quality version today, which is 720p, and watched it on my XBOX. The messed up the framerate (it averages 14fps), which was distracting. The image was sharp, but choppy. I'd rather have had a little blurrier image that was smoother. Also, the "Live" watermark was still on the video, which was a little silly. As for the debate itself, it was very entertaining. 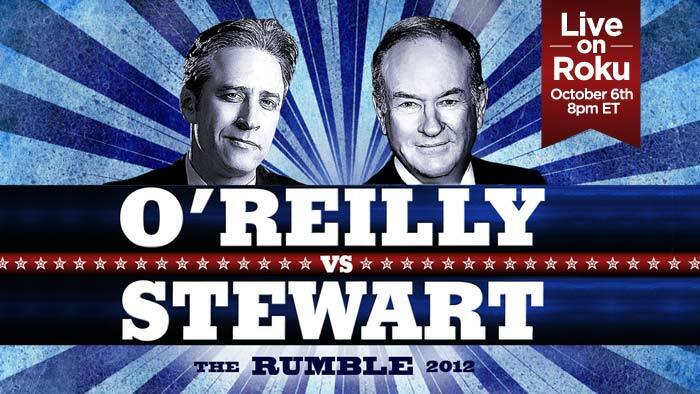 If you've ever seen O'Reilly and Stewart together on one of their shows before, you pretty much know what to expect. They've updated the videos. The "Live" watermark is gone, and the framerate is now a steady 30fps. They also added a even-higher bitrate option, with a download size of 3.4GB.